Part 1 of a two part show about the Open Everything event from Hollyhock on Cortes Island, BC. Duane interviews Joel Solomon who talks about Renewal Partners, social change and technology while contemplating what “Open” really means. During the Code and Tunes segment of the show, we show how to use svn, ant to retrieve and compile the free Flex SDK from the source code repository. Music guests 22nd Century offer a free music download. Stop using the term "Web 3.0"!!! I recently became aware that despite attempts to educate people to the contrary, the term "Web 3.0" continues to be used. It is only natural I guess given we use the term "Web 2.0". I do believe using either term in a purely literal sense is flawed as the convention is to use this to denote major version changes to a thing. The web is full of change but it remains incremental. To my knowledge, there has never been a wholesale, overnight, non-backwards compatible change to the entire Internet. I highly suspect Tim O'Reilly used the term in the exemplar context rather than as a literal term. Nevertheless, it seems to have run away now on its own. Let's examine why it is flawed as a path for the web community. "Web 3.0, a phrase coined by John Markoff of the New York Times in 2006, refers to a supposed third generation of Internet-based services that collectively comprise what might be called 'the intelligent Web'—such as those using semantic web, microformats, natural language search, data-mining, machine learning, recommendation agents, and artificial intelligence technologies—which emphasize machine-facilitated understanding of information in order to provide a more productive and intuitive user experience." Let's start by ripping this apart. Semantics is the "meaning" of something. Like architecture, everything that exists can be linked to it (everything has an architecture, whether explicit or not). There is a triangular lexicon of the major concepts in most semantics work which includes the Referent (the object in question), the Term (the name or symbol representing the meaning and linking it to the referent) and the Conceptual domain (the place where meaning exists). There is also a fourth dimension of semantics which is a contextual plane. This is the set of circumstances that surrounds an object in question and can affect its meaning and importance. Most semantics work gets stuck in the label region. 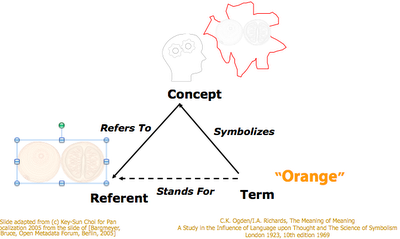 It really should be done in the conceptual domain, which is the focus of ontology work. During the presentation I gave at Web 2.0 Expo earlier this year entitled "Ontologies for the Enterprise", this was explained (there is a link to the slides). Since the objects and labels exist today (plain English is a natural language filled with terms or labels for just about every referent that exists), we have the tangible parts of the Semantic Web today, hence there is no logic behind advancing the version number of the web to Web 3.0. I think Tim has stated himself that it was a bad idea to name it Web 2.0 as it leads to this kind of foolishness and (I would presume) that "Web 2.0" should not be taken literally as so many have, but only in the exemplar context. What we need to concentrate on is the Conceptual plane's ontology work. While a lot of this does exist today, making it more explicit and providing concrete interfaces to such work is where semantic web work should be focused IMHO. Some of the other elements cited in that Wikipedia entry exist today, including microformats and natural language searching. Google and Yahoo are both very competent at searching (when was the last time Google could not find what you wanted?). Don't get me wrong - John Markoff is a true genius and I deeply respect him. I think what I can infer is that John summarized what he noted other people have used the term to describe. Web 2.0 is a collection of design, architectural, social, and business patterns implemented over the Internet. Some of these patterns deal with semantics, microformats (Small Things, Loosely Joined) , computational intelligence, data mining, and more TODAY! The pattern of "the constant beta", a pattern whereby continual, incremental innovation happens, ipso facto denotes that no further version numbers (like Web 3.0) should ever be used as the Web embraces the notion of change at its very heart. I vote that the web community never version the web with 3.0, 4.0, and so on unless there is literally a non-backwards compatible version of the Internet invented. That is my $0.02 CAD worth! The talk James Ward and I are delivering on day one of Adobe MAX 2008 is filling up fast. The talk is entitled AIR Boot Camp and will be delivered both in San Francisco and Milan. Curious about AIR? This is the place to go! If you are planning to attend, please register soon, space is limited to only 300 and it is over half gone as of today. Teachers Aides: Andrew Spaulding (need 2 more). who have never used it before or want to go past Hello World. Join us for an introduction to working with Adobe AIR, in which we will build several projects from start to finish. Projects include "HelloWorld.air," a video player, a "full screen" application, a web service client, a simple example of how to make remote calls, a chromeless window application, writing data to and from a hard disk, working with XML (including RSS feeds), and packaging AIR applications for later distribution. Course materials include the presentation, all code for the projects, and a step-by-step written tutorial. Code, Code and more Code! 8. Working with XML - all about E4X, pre-requisite to learn how to manipulate RSS and Web Services call returns. I am angered today by the continuing rhetoric from Washington on how to solve the financial sector meltdown. The powers that be want to spend Americans tax dollars (hard earned by the average American) to bail out big Wall Street firms. Under the current plan, this includes paying CEOs multi-millions of dollars for running a business into the ground. Is this fair to the average person who works very hard? Will this even solve the problem (it really just transfers debt from one balance sheet to another). Luckily, several legislators have jumped in to question the bill before congress. Why not give the money directly to the homeowners to pay their mortgages? If the big Wall Street firms still cannot survive, let them die but do not take money from Americans to give to companies who have flawed business plans. From my limited understanding, it appears that under such a plan, the average American would be able to keep their house, most of the big banks would benefit from lower foreclosure rates and not fall into chaos and the average American would then have extra $$ to further stimulate the economy. Note that the entire deal could be done via immediate tax cuts. After all, aren't Republicans supposed to be about small government and lower taxes? What sense does it make to have a big lender financially solvent while having millions of people out on the streets, no longer having a home? There are lots of smart people in the financial sector. Warren Buffett warned of the time bomb the derivatives practices would have on the sector over five years ago. He called them financial weapons of mass destruction. Why did some chose to ignore him? What about those who did heed the warnings? There is certainly a lot of good opportunity to see which banks and mortgage lenders are left to take the business lost by their insolvent counterparts.